In an easy-to-understand manner, S. N. Goenka explains what Dharma is. 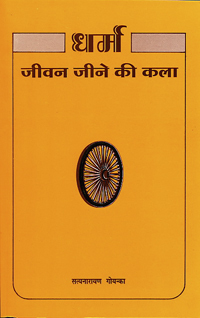 This book was written by S. N. Goenka in Hindi in 1976 and translated into Gujarati, Marathi and Sindhi. This is not a translation of "The Art of Living" by William Hart. Useful for meditators and non-meditators alike. I am currently reading the English translation of this book and I highly highly recommend it for anyone who wants to deepen their understanding of Vipassana Meditation. The Hindi and Gujarati versions, I got for my family members and I have a feeling they would greatly recommend it after reading. If you are looking for a book that will help you contextualize your experience during a 10-day retreat, this book does it. It is priceless!